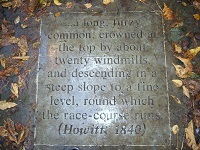 Although the 1845 Enclosure Act allowed for up to 130 acres of land to be allocated as open space, the only places specifically named were the Race Course, the Cricket ground and the Military Training Ground on the Forest. As the cricket ground and the military training ground, or cavalry ground as it is sometimes known, were inside the oval of the race course, these are essentially the same place. 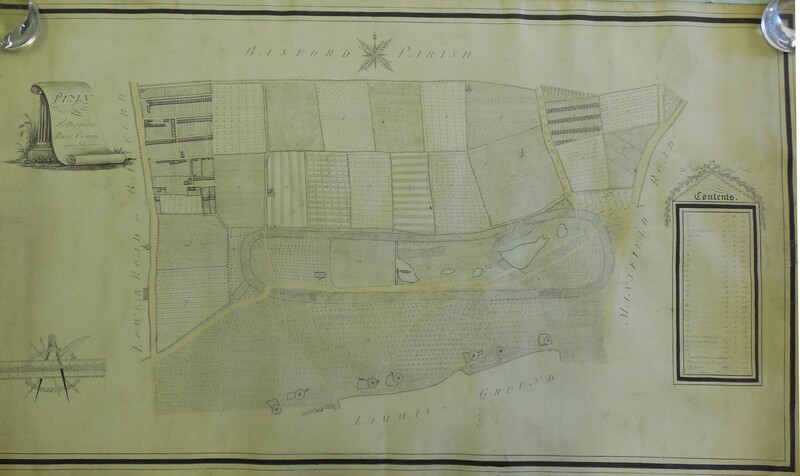 This plan of the race course, made before 1845, shows the course surrounded by open fields. Before 1845, the course was leased to a consortium of gentlemen led by Lord Edward Bentinck. 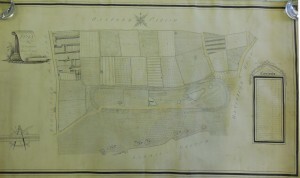 The Enclosure Act allowed the Town Council to call in the lease and from 1845 the course was managed by a sub-committee of the Council, known and the Race Committee. Like other sub-committees, it reported to the Town Council and presented its accounts annually. The Committee made some improvements to the course, levelling and fencing the area. The annual reports, however, became briefer and after 1860 the Race Committee stopped reporting to the Council and essentially acted as an independent body. 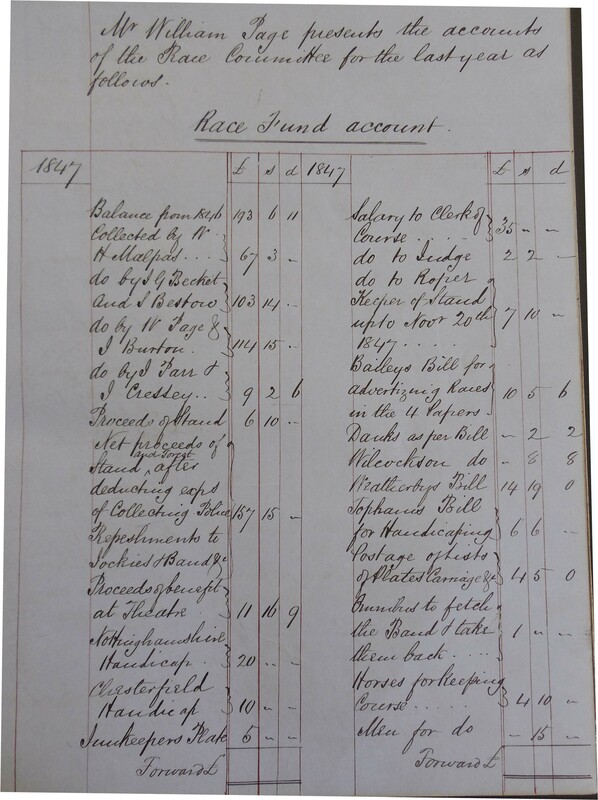 In 1881, the Town Auditor asked to see the Race accounts, which were eventually, and reluctantly, handed over to him. 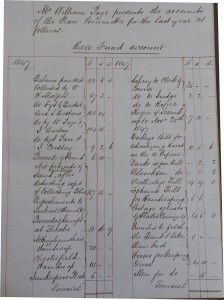 In his report of 1882, the Auditor protested that although the Race Committee had £873 4s 10d in their bank account, this was not accessible to the Council. As well as the race course, there was also a grand stand which could hold 500 people, and a ‘betting ring’ – the only place where gambling was legally allowed, though much illegal gambling must have happened elsewhere. The races were free to everyone except those who chose to pay for entry to the grandstand, who were, of course, the elite of the county. There were two race meetings a year; the first on started on Shrove Tuesday and the second was held in July. A report in the Nottinghamshire Guardian for 18 July 1851 describes the extent of these meetings. In addition to the races there were 50 or so ‘booths’ selling alcohol, a booth for bare-knuckle fights which the police closed down before any matches took place, a roulette wheel next to the grandstand, and there were many ‘notables’ attending for those who wanted to do some 19th-century celebrity spotting. A later report, in the Jackdaw mentions swings, roundabouts, shooting galleries, strength and lung testers and foodstalls. The same journal also many examples of anti-social and illegal activities. In 1875-6, the July meeting was moved to the first week in October. Initially, the races were held on Tuesday and Wednesday and overlapped with the opening days of Goose Fair which then ran for 8 days. The Jackdaw article mentioned earlier suggests the two events had common elements. In 1879, Goose Fair was reduced to 3 days, starting on Thursday, so the races became the main attraction before the Fair and made a full week’s entertainment. In 1886, however, under pressure from Leicester and Kempton Park – both larger, commercial race courses – the meeting was moved to Monday and Tuesday. Consequently, the meeting probably became less popular with both owners, who would not transport their horses on Sundays, and with attendees who then had an extra day to kill before Goose Fair. At the same time, the Races were becoming increasingly unpopular probably because of concerns about illegal gambling, the evils of alcohol, and general anti-social behaviour in what was now a residential area. The irregularities in the management of the race course may also have influenced opinion In 1889 and 1890 the Council received petitions from clergymen, church groups and the general public asking them to stop the races, and the last meeting took place in October 1890. The races, of course, moved to Colwick Park, but under the management of a private company that bought the land and ran it as a commercial venture. One of the principal directors of the new company was Alderman Dennett, who had been Chairman of the Council’s Race Committee.